Proceeds could go to assistance of those brothers being persecuted for upholding the One True Faith. "The apostle must be polite, serene, enthusiastic and happy and transmit joy wherever he goes." Has he read St.Paul? How does one "transmit joy"?? Wwwarner could publish it. Then it would get the cover all the major mags and folks world wide would become de facto disciples of Luther. 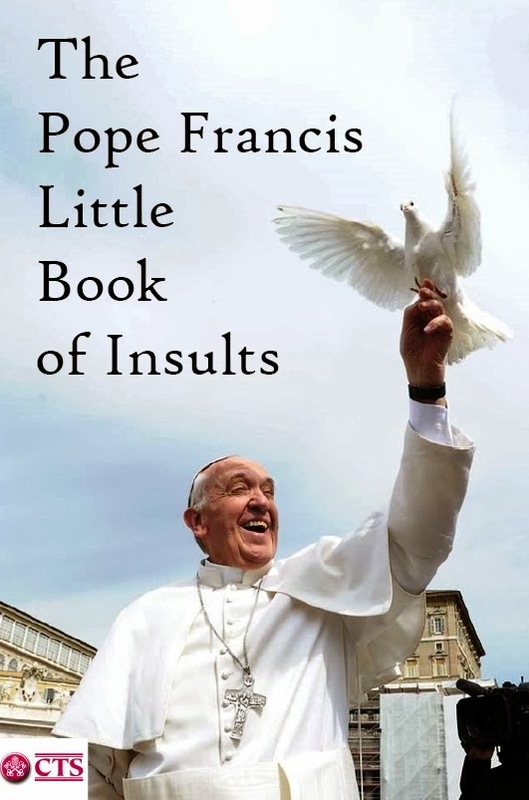 But if it were called 'Heresiarch-Bergoglio's Liitle ... ' maybe some Lutherans would look up the Popes. Pharaos live in pyramids, don't they? OK, that's right, everything is in order.....till the Master will come. Lynda I think he means walk around with a big dopey, vacuous smile on your face all the time except when you're addressing Traditional Catholics at which point you should always resort to the scowl. I think my sister has recently checked into publishing---I think it's Amazon who does it really inexpensively, and I would be honored to contribute to the cause. I'd love to send a copy on to HH to spread a little Christmas cheer, as he has done, and will probably do again, for the Curia. Thank you for the spiritually-nourishing advice!! Lynda... Don't I know you from the Epididymus Fowler? Do you still smell like fish? ?